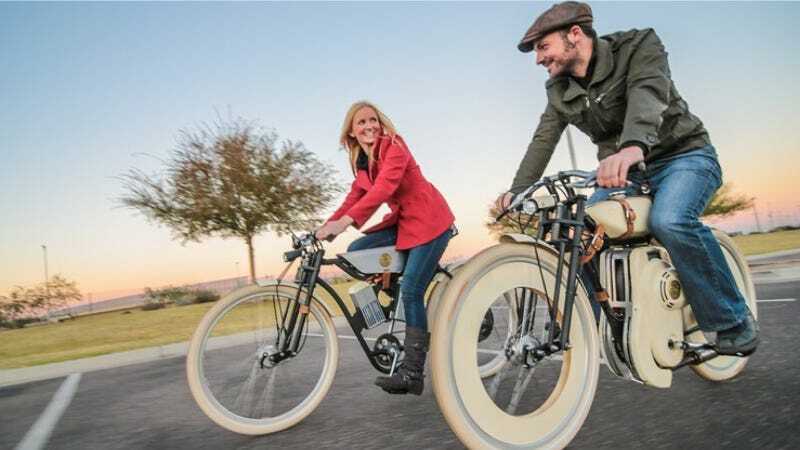 Boutique builder Local Motors, best known for the fierce-looking Rally Fighter, has taken to crowdsourcing capital for their latest endeavor— a line of steampunk-styled motorized bicycles. Electric: Rear hub motor with regenerative brakes, 20+ mile range per battery set with the capability to carry a second. Gasoline: Projected to hit up to 150 mpg for a total range up to about 70 miles. The Wild Wild West styling is a result of Local Motors' design challenge, which was to create something "reminiscent of the early 1900s boardtrack racers." Designer Ianis Vasilatos was one of hundreds of entrants to submit designs, and his was picked as the final shape. In case you forgot, all this outsourcing is actually the norm for Local Motors. The idea behind their company, in their words, is to "co-create vehicles and related components with a global community of designers, engineers, fabricators and enthusiasts." Basically they want to be the catalyst between people with ideas and people with money to support the development of interesting vehicles like this Cruiser bike and the Rally Fighter. I'm not sure how many people will be enticed by the offers of "inclusion on the Cruiser Supporters list, limited edition Cruiser T-shirts and signed prints, and opportunity to own one of the first 30 production units", which are listed as the rewards for contributing capital, but if this baby's built I bet it'll be big in Brooklyn.